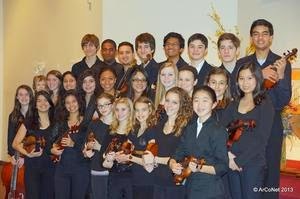 ArCoNet, The Arts & Community Network is inviting all string players in the Philadelphia greater area to audition for the 2014-2015 ArCoNet's Youth and Chamber Orchestras. ArCoNet's Orchestra Program offers unique performance and educational opportunities to students while building strong connections with communities and creating excitement about music. ArCoNet members have been selected as principal chairs and section players in County, District, Regional, State and National Competition. Alumni from ArCoNet programs have followed careers in the music field, attending prominent institutions including the Curtis Institute of Music, the Cleveland Institute of Music, Jacobs School of Music at Indiana University, Shepherd School of Music at Rice University, New Englang Conservatory among others. Do not miss the chance to play concerts, attend master classes and learn fantastic classical, modern, contemporary and Latin American repertoire with some of the best string student, semi-professional and artist faculty in the region! Contact Director, Adriana Linares, to schedule your audition. Auditions will last 10-15 minutes. ArCoNet Orchestra season runs from October-December and February-June. A detailed schedule is provided once the student is admitted.